Jennifer and Austin got married on the SAME day as Ashton and I last July... AND she goes by “Jenny”! She uses a million emojis and exclamation points (🥰🤩🤗), and makes me feel like I’m wayyy more important than I actually am! 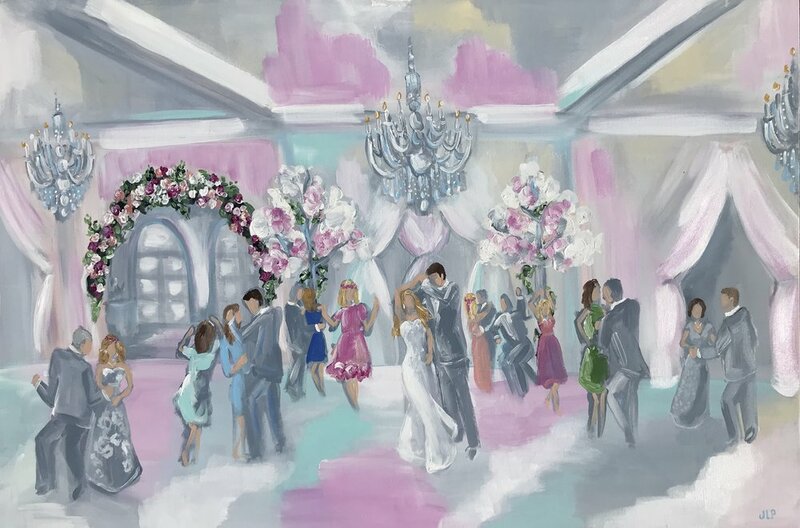 It was a joy and a pleasure to do this sweet painting for you both, Jenny and Austin! I’m so honored:) Cannot wait to meet you one day! WHAT A DREAM!!! 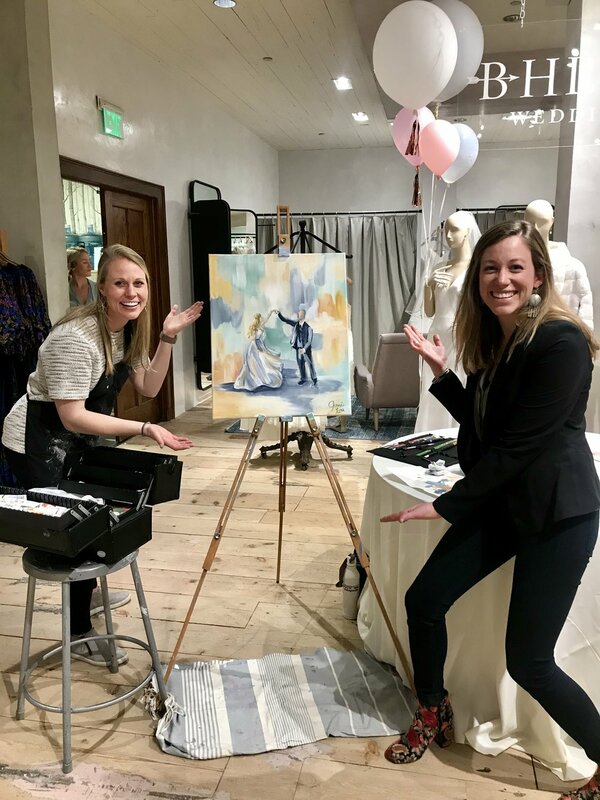 I had so much fun live painting at the opening of Anthropologie’s BHLDN store at the Cherry Creek Mall in Denver, Colorado. I looked around and I could have purchased every single thing in the store! What a dream to work with my favorite clothing line. I hope to do more with Anthropologie in the future:) Thanks to all my friends who came to visit me at the opening! First wedding of 2019!! - The bride’s parents hired me as a big surprise and we managed to pull it off! Mission accomplished - tears and big smiles! It was a challenge hunting down family members to paint in, but it made the painting that much more special. 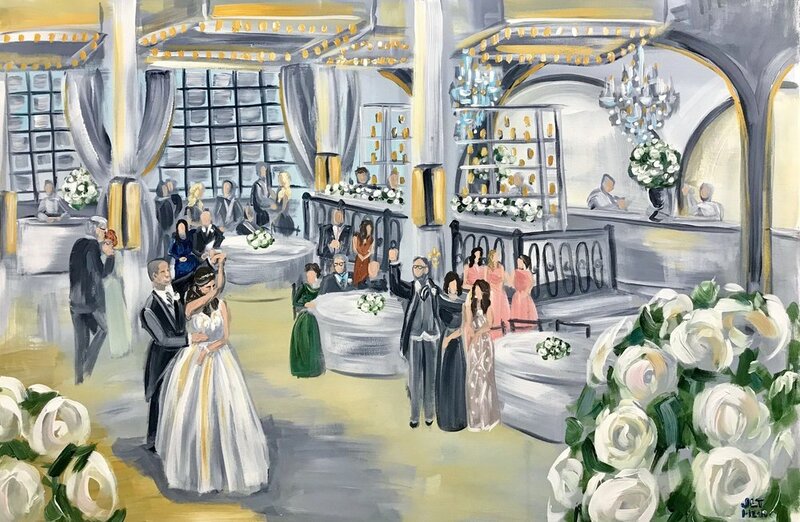 Dad’s request was to put a fluer-de-lis in the painting as a testament to their Louisiana roots... see if you can find it! Secondly, Texas summers can get really hot, and this wedding was no exception. It was 102 outside for this precious couple's outdoor ceremony at the bride's family home on Lake Travis. The guests were such troopers the whole time, until it just got to be too much - one person jumped in and the rest of the wedding guests followed, including the bride and groom! Last weekend I was in Houston, Texas painting at the lovely Astorian. The classy venue is tucked away in an unassuming industrial part of town, and has wonderful views of the city! I really enjoyed incorporating the buildings into the skyline, and doing my best to draw lots of straight lines for the windows! Austin and Mason are the loveliest couple, so genuine and sincere! I saw lots of Baylor friends, and enjoyed engaging with the crowd! Congratulations to Mr. and Mrs. Jolesch!! This was a first to paint on a balcony behind glass walls, where everyone can see you but you can’t hear them! I kept looking down to see people frantically waving at me, while “painter focus mode” tried to keep me on task. I’m sure they saw me dancing to the music up there – this band was amazing!! Thank you to the most elegant, Mr. and Mrs. Maloney!! Your dance classes paid off, you two owned that sparkly dance floor. 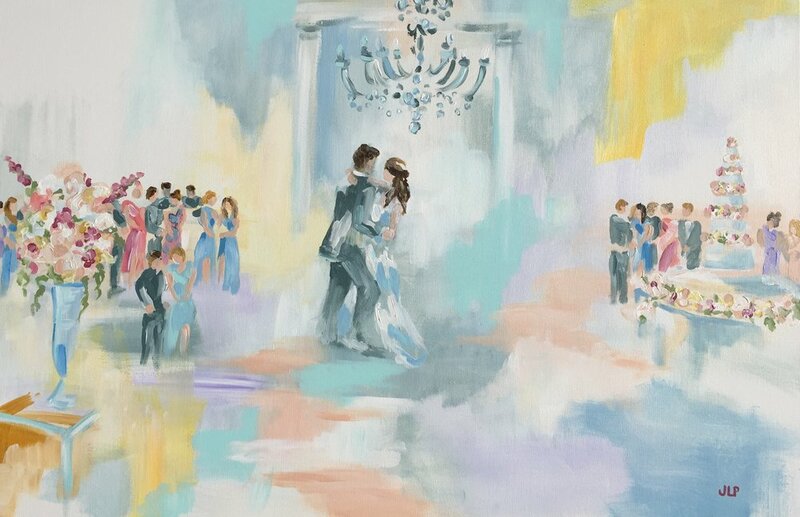 Now I’ve painted all three of the Jarvie weddings, and it is so fun running into all the familiar faces! Such a precious family, and they sure know how to throw the most beautiful weddings! I am always honored to work with the same families again.